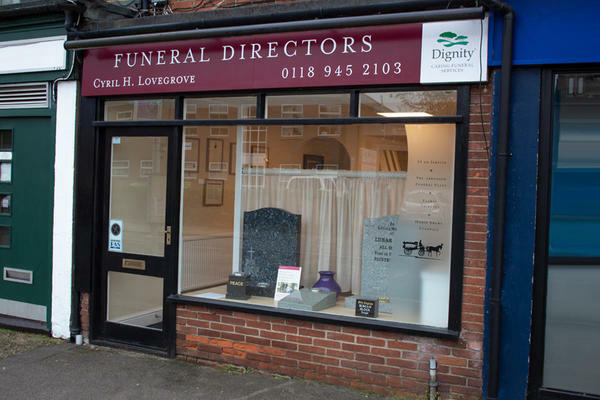 Welcome to Cyril H Lovegrove Funeral Directors in Tilehurst, Reading. We are your local Dignity funeral directors, which means we are dedicated to giving you nothing but the highest standards of funeral care. We are here to help you in any way we can during what we know to be a difficult time. From church services to woodland and green burials, however you wish to say goodbye, we will always be able to help you . Your well-being is paramount, so you can count on us for all of the support and careful guidance you may need. No request is too big or too small for our compassionate team. Our Tilehurst funeral directors on School Road was founded in 1988, which means we have experience in caring for the families in our community. We help people from all over north Reading and further afield, including Calcot, Sulham, Norcot, Southcote and beyond. We want you to know that you are not alone, and that you can call us at any hour of the day on 0118 945 2103. We have parking for two vehicles at the rear of our funeral home, as well as a large pay & display car park nearby. We are located on School Road next door to Tilehurst Veterinary Centre. Our staff are available 24 hours a day on 0118 945 2103 if you require our services outside of these hours. Excellent,very helpful and kind,everything we asked for was done with no problems.